Gear Check: Katie Mahaffey, the ship’s Program Support Specialist and dive master, inspected everyone’s diving gear to make sure that it operates correctly. If any equipment is malfunctioning, it can cause serious problems for a diver. She also showed everyone where to store their diving gear. Although I will not be diving, I was given a locker to store my snorkeling gear, my life jacket, and my hard hat (life jackets and hard hats are two very important pieces of safety equipment on ships). O2 and Back-boarding: At this station, we learned what to do in case there is some kind of accident in the water and a diver becomes injured. We were trained on how to administer oxygen from a tank of emergency O2 and on how to strap an injured diver onto a backboard for safe transport. Both of these items are carried on the small boats that take divers out each day in case of an emergency. 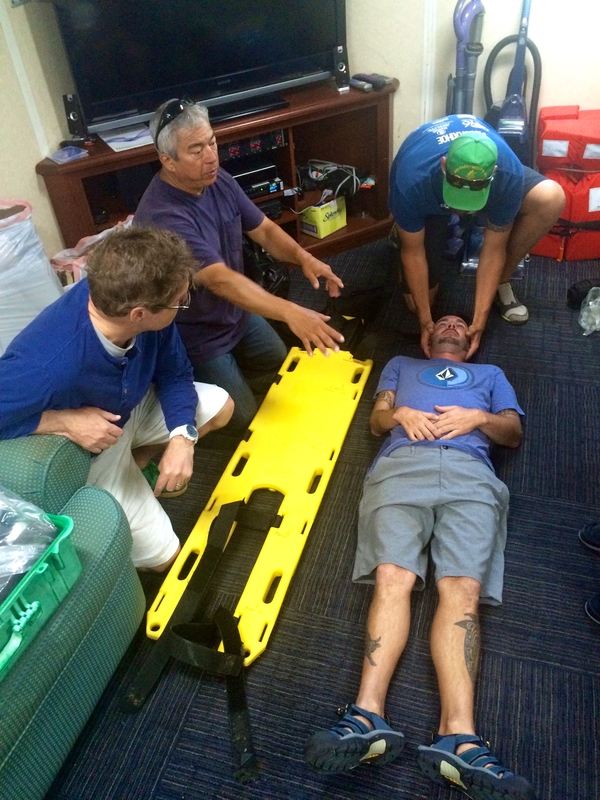 DEAP and EPIRB: DEAP stands for Diving Emergency Action Plan. 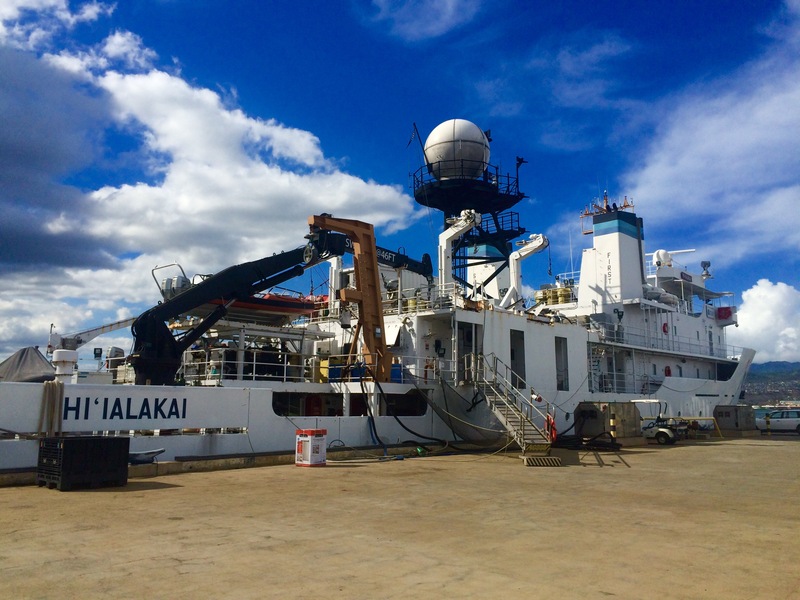 Each team of divers is supposed to know and follow NOAA’s plan for emergencies while diving. An EPIRB is an Emergency Position Indicating Radio Beacon. It is a handy device that can send out a signal that can be used to help locate a diver’s position in the water in case she/he becomes separated from the boat. In the comments section below, I would like you to write what the signal is for abandon ship! Here I am in my immersion suit. Today, we went through a fire drill and an abandon ship drill. As you can see on my billet, in the case that we have to abandon ship, I have to muster (gather together with others) by life raft 1 on deck 03. 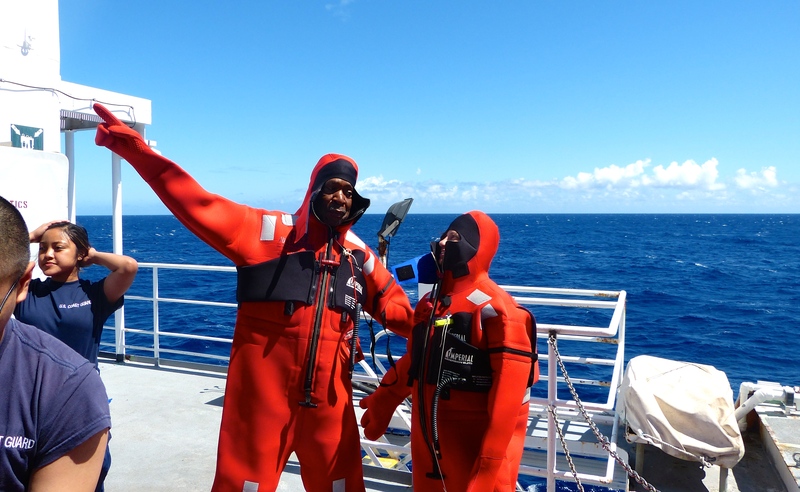 When you abandon ship, you not only have to muster at your designated spot so that the ship’s crew can account for everyone, you also have to put on an immersion suit. This suit is designed to protect you in case you have to be in water a long time, and it makes you look like a red Gumby. The view from the top of Diamond Head is amazing. Before I boarded the Hi’ialakai in Pearl Harbor, I got to have a few adventures on Oahu. First, I hiked from my hotel in Waikiki to the top of Diamond Head. 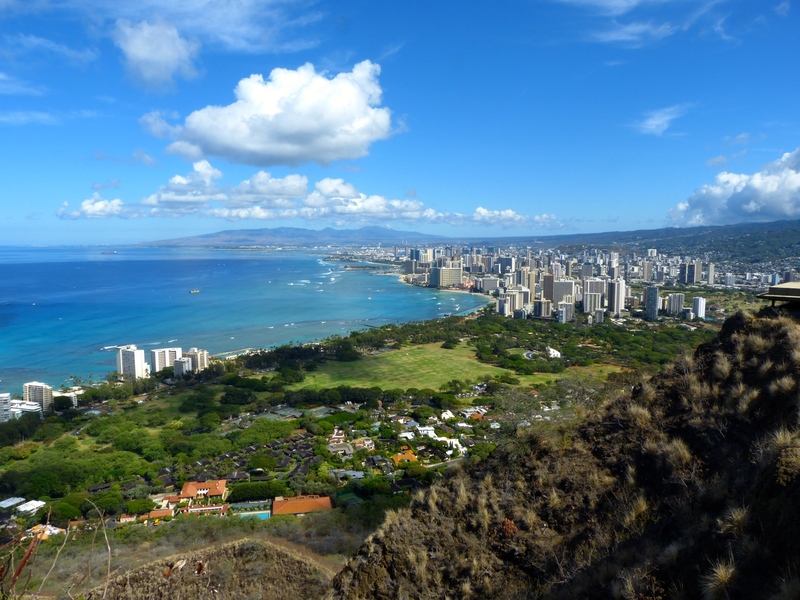 Diamond Head is the crater of an extinct volcano, and there is a fantastic view of Honolulu and the coastline from the top. 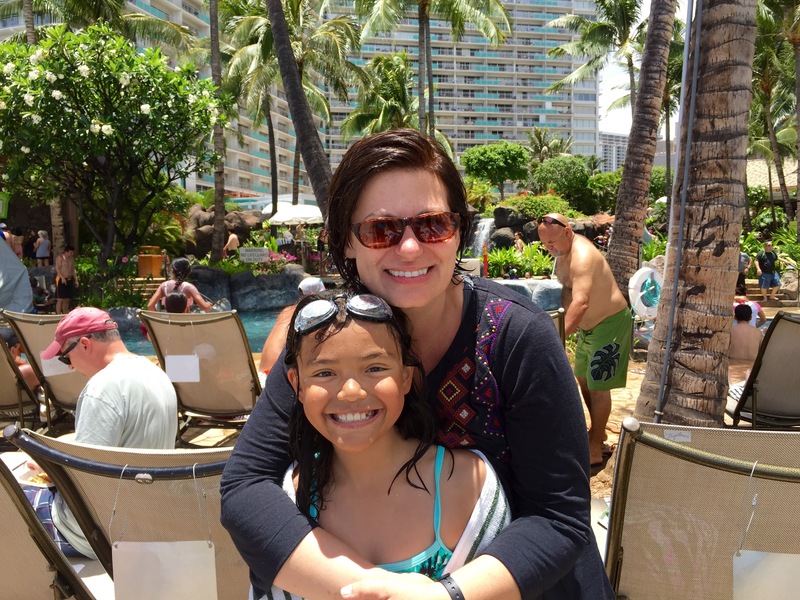 It was a long, hot, and sweaty uphill hike, but at the end of it, I ran into one of my lovely students who is vacationing with her family in Hawaii, and went swimming with her at her hotel’s pool. Hello, Emogene! It was also a state holiday while I was there, King Kamehameha Day, which honors Kamehameha the Great, the king who first established the unified kingdom of Hawaii. There was a parade that day to celebrate. 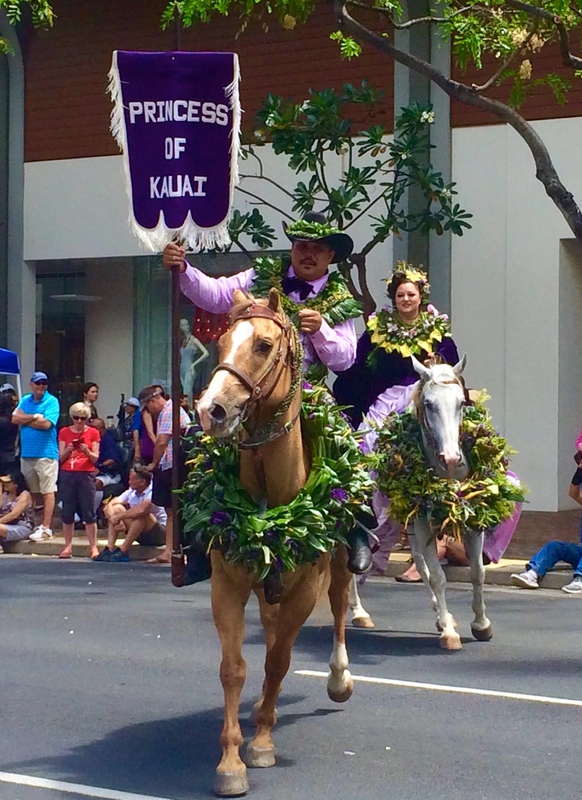 Here is a picture of the Princess of Kauai from the parade. 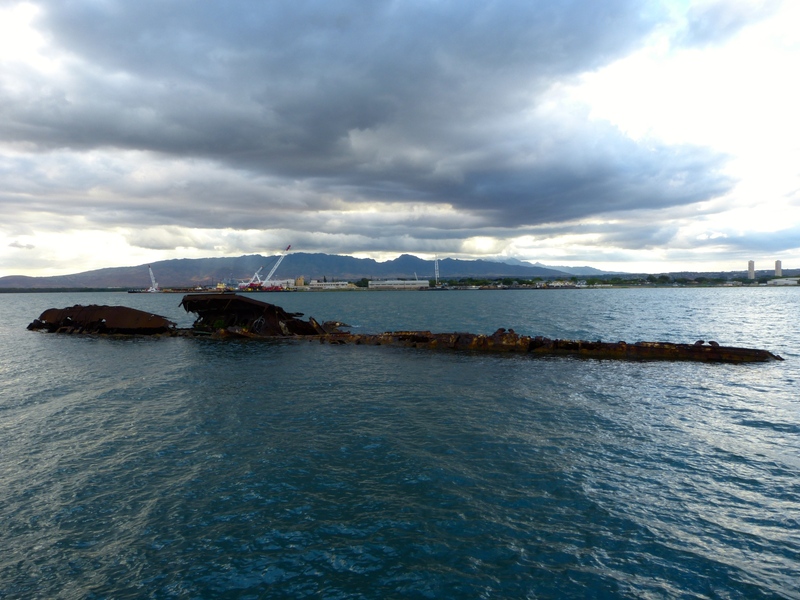 Here is a photo of the shipwreck of the USS Utah, as I promised to Joanna. Soon after I came aboard, I had to get to know my way around the ship and learn some important words that indicate location on a ship. These words are used on all ships, no matter what their affiliation. Thankfully, I have not suffered from any sea-sickness, but it has been a challenge trying to walk in a straight line! The word SCUBA in scuba diving stands for Self-Contained Underwater Breathing Apparatus. Most divers use an open-circuit scuba, where the diver’s exhaled carbon dioxide is vented into the water in the form of bubbles (like when you blow out from your nose under water in a pool). Scientists are concerned that these bubbles may scare away the fish they are trying to study and count while they are under water, so on this trip, some divers will be trying out rebreathers. Rebreathers are designed so that when a diver exhales, the gas is circulated back into the apparatus instead of being exhaled into the water. No bubbles! The answer to the previous poll was: Corals get their various colors from the algae that live inside them. 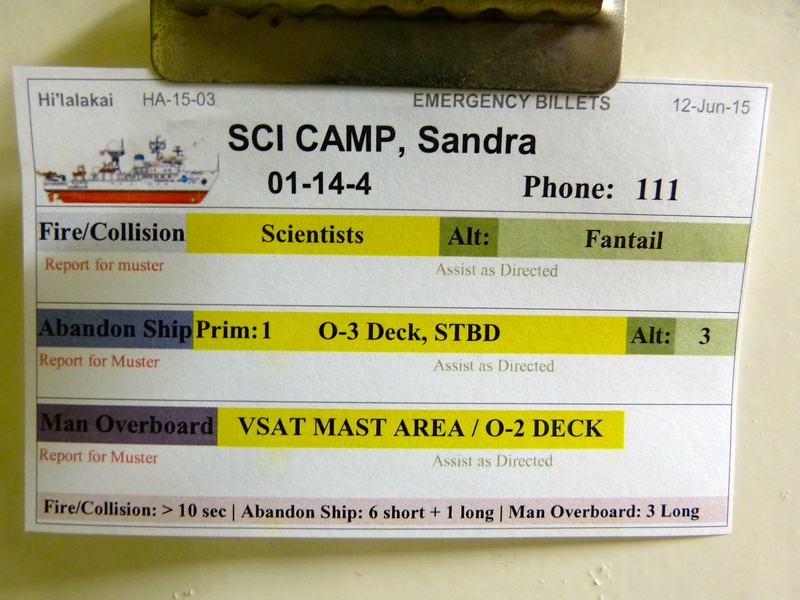 This entry was posted in 2015, NOAA Fisheries Service, NOAA Teacher at Sea, Sandra Camp and tagged backboarding, billet, gear check, Immersion Suit, pearl harbor, safety tests, SCUBA. Bookmark the permalink. Nice Gumby suit! What is the average water temperature in the areas you will be studying and diving? We are off the coast of the Big Island today, and the water temperature is 77 degrees Fahrenheit. Thanks Ms.Camp!😏 I hope my parents let me bring my iPad to Mexico because I want to read your blogs over there too. I just saved the shipwreck photos to the photo gallery. So awesome!!! I love Mexico! When are you going, Joanna? Hopefully, you can do some snorkeling there. I’m going to Puerto Vallerta and we have plans to go snorkeling. I’m pretty sure I’m going zip line instead. We are leaving on Monday and I can’t wait. Whoops! Typing too fast! I meant going zip lining! I hope not either! The suit is the least of it–you should see the Jacob’s ladder. You are awesome, Ms. Camp!!!!!!!!!!!!!!!!!!!!!!!!!!! You are awesome Ms. Camp!!!!!!!!!!!!!!!!!!!!!!!!!!!!!!!!!!!!!! Thanks, Nicolas! Have a good swim season! 😊 Ms.Camp, such an awesome teacher. Thank you, Rachel! I hope you learned some interesting things from the blog.